These cookies remind me of when I was a little girl and my grandmother would bake on a rainy day. Preheat oven to 350 degrees fahrenheit. Place oven rack in the center of the oven. In a medium size bowl mix the first 4 ingredients together and set aside. In another medium size bowl with an electric mixer cream together the butter, brown sugar, vegetable oil and vanilla. Add the egg and beat again making sure everything is well mixed. With a spoon mix the wet and dry ingredients together well. 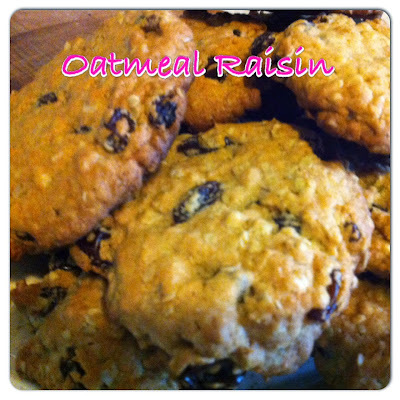 Add the raisins mixing again. With a soup spoon measure out the cookie dough (making a rounded ball) and place on the parchment paper. Press each cookie with the back of the spoon. Place in the oven for 14 minutes. This recipe will make 20 - 24 cookies. They sound so delicious. I love baking and eating cookies. Thanks for sharing your recipe.